Sunburst Tangerine is a variety of tangerine that has a very smooth, thin rind. The rind is so thin that you can see ridges from the segmented section of the flesh. 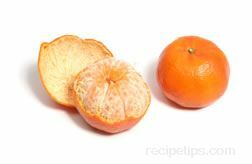 Its rind is a dark reddish-orange color and is easy to peel. The flesh is deep orange colored and has a rich, sweet flavor. The Sunburst has little or no seeds. It is available from November through the middle of January.